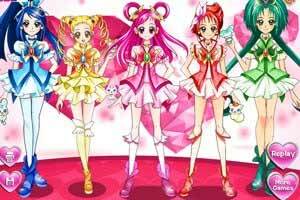 A beautiful game featuring five of the magical girls of the anime series Pretty Cure! Dress up Akimoto Komachi, Natsuki Rin, Yumehara Nozomi, Kasugano Urara and Minazuki Karen in variations of outfits from the show. You can add their fairy friends, jewelry, adornments, shoes, stockings, hairstyles and dresses. The art is super cute and everything meshes really well together. At the end, click Show to see all the magical warriors together in the scene.